With many things in life you get what you pay for and with the Vango Viper range of sleeping bags you are investing in your own comfort. These sleeping bags may appear at first glance to be not as cheap as other bags. However, having spent a lot of money on your tent why would you skimp on your own comfort at night? A good nights sleep is worth a lot and can make or break a camping holiday so make sure you buy the best sleeping bag around – the Vango Viper. The Vango Viper has three bags in its range, the Vango Viper 500, 750 and 1000. Omega shaping—the is larger at the top than at the bottom. This keeps your body warmer by reducing any excessive air spaces within the bag. ATC – Advanced Trapezoid Construction—angled chevron baffles prevent the down from moving and increases thermal efficiency by slowing heat loss comparable to similar rectangular shaped baffles. 90/10 550+ fill power down—excellent quality providing maximum loft, warmth, performance and durability. Differential fill—insulation where it counts. Independently tested—temperature ratings independently measured in accordance with EN 13537:2002. Polair® Micro RSN shell—micro-ripstop, soft, downproof, water resistant and washable 3-panel, 3D hood with multi-cord closure—allows maximum adjustment. We think the Vango Viper is a quality product and this is reflected in the price. The Vango Viper 500 is a good all rounder and will keep the UK camper warm at night from mid spring right through to late Autumn. Fortunately, or unfortunately, nights during the summer don’t really get any warmer than 20 °C which is ideal for the Viper 500, although we think that the Viper 750 and 100 would be too warm for use in the summer months. 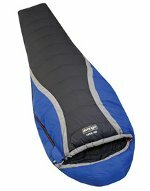 Can someone let me know which is the better type of sleeping bag to buy, synthetic or down?